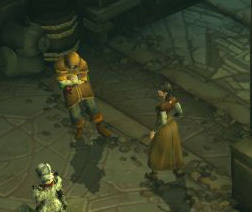 Deckard Cain wrote much about the Pandemonium Fortress. He kept meticulous notes, drew sketches, and even made some maps. But nothing matches what is there now. 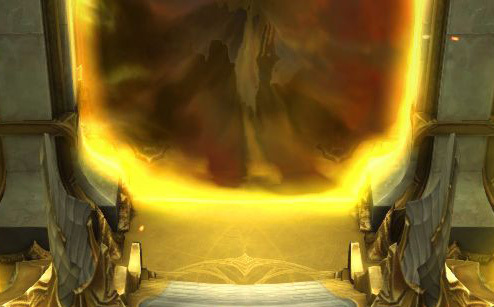 The fortress has changed so much since Malthael took over. 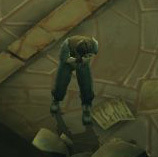 The people of Westmarch are starting to rebuild the city and bury their dead. Their strength is an inspiration. But there are children that witnessed their family being torn apart. Others climbed over piles of corpses to get to safety. What will they make of the world when they grow up? The city has scars that will linger for generations. I thought on what you said, and you may have been right. 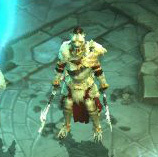 I can't bear the thought of another friend's death. 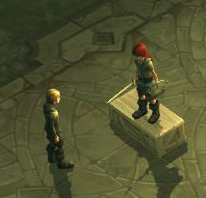 I have lived a solitary life, Haedrig. I do not believe it is any easier. It feels like a lifetime since last I held this jewel in my grasp. The memories flood back into me. I was a vain fool in my youth. I know it will be hard for you to think of me so, but it's true... though it was a long, long time ago. 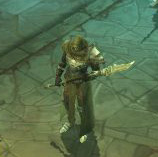 Well, Dirgest has escaped, and it's more important than ever for me to find him. Imperius will soon need your help, but he will hate you for it. That is something I am used to. You don't understand. I'm no hero. Do you know why I was there? I ran away. From my unit, from my friends. While they died, I ran. I tried to leave the city today, but the gates are all closed. 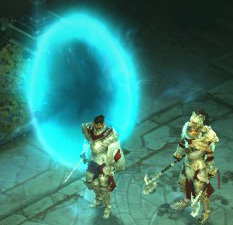 The guards won't let anyone in or out. Stay here and hide, I guess. I am a coward. Stop that. You're a good man. I see death everywhere. Even when amongst the living. I see the spectre of endless night. But you are different. Death's shadow surrounds you. It obscured all else. I joined a caravan of refugees heading to Bramwell, but we never made it there. 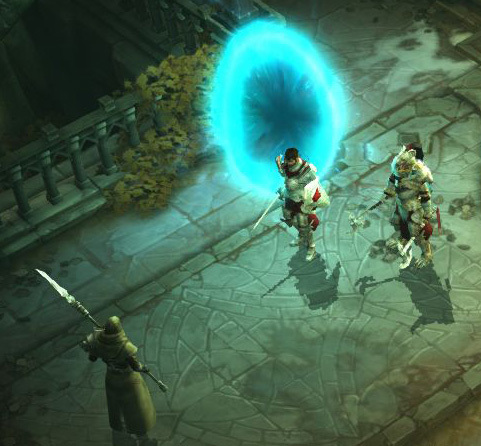 Brigands slaughtered everyone. I ran into the forest and hid for days before I dared come out. How am I ever going to find my son? 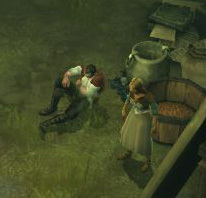 Pieter and Lera have been playing hide from the monster all day. Such imaginative children. I do not see any children. I said they were hiding, didn't!? 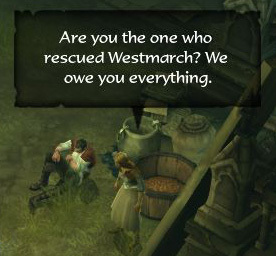 Are you the one who rescued Westmarch? We owe you everything. 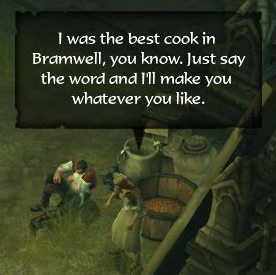 I was the best cook in Bramwell, you know. Just say the word and I'll make you whatever you like. 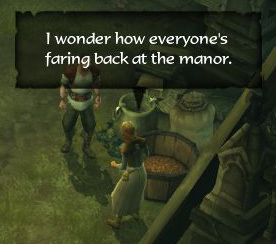 I wonder how everyone's faring back at the manor. They're fine. 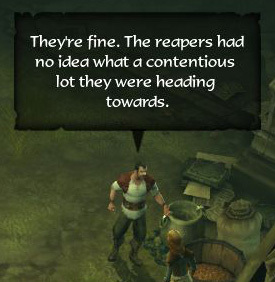 The reapers had no idea what a contentious lot they were heading towards. 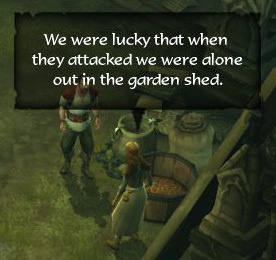 We were lucky that when they attacked we were alone out in the garden shed. 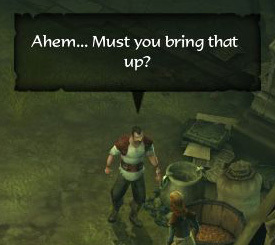 Ahem... Must you bring that up? 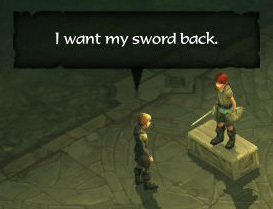 I want my sword back. 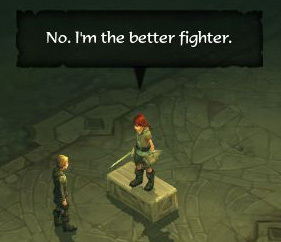 No, I'm the better fighter. 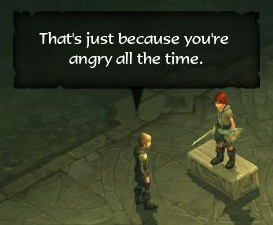 That's just because you're angry all the time. 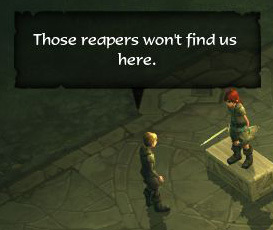 Those reapers won't find us here. I know. 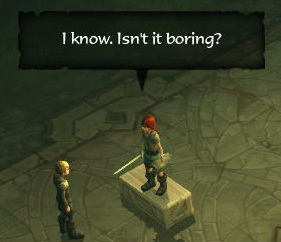 Isn't it boring? 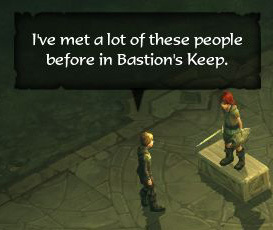 I've met a lot of these people before in Bastion's Keep. 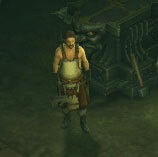 The blacksmith is Haedrig. He's grumpy. 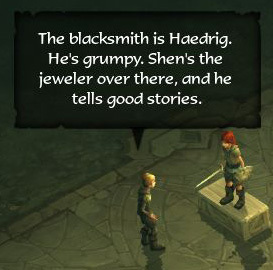 Shen's the jeweler over there, and he tells good stories. 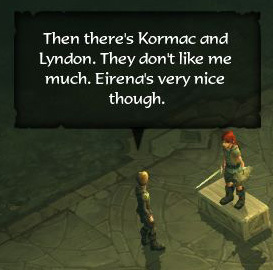 Then there's Kormac and Lyndon. They don't like me much. Eirena's very nice though. Sorry. 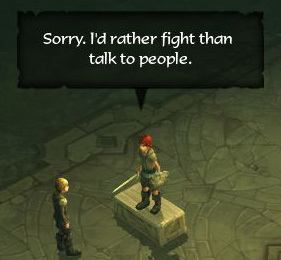 I'd rather fight than talk to people. 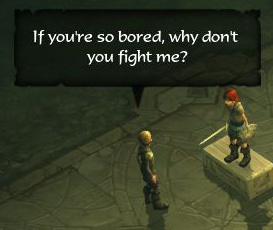 If you're so bored, why don't you fight me? 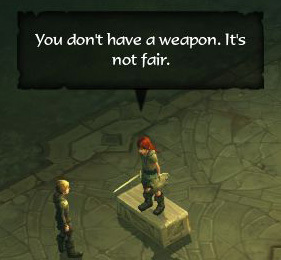 You don't have a weapon. It's not fair.